Little boys are so full of energy and their imaginations seem to literally run wild. Halloween is such a fun time in our home as we dress up our boys in fun and creative costumes. We love these Halloween Costumes for Boys – there are choices from pilot to pirate! If we were to try to buy superhero costumes at one of those pop-up Halloween shops, we could easily be out a few hundred dollars! If you’re on a tight budget, or just looking to spend your money smarter, you need to check out Blue Digger! All of their costumes are reasonably priced, and most of them are less than $50! If you’re in need of some affordable costume inspiration, don’t miss these costume ideas. 1. Fighter Pilot Costume – This custom, one-piece design features all of the patches and details that your little fighter pilot needs to take off for Halloween trick or treating! 2. Champion Racing Suit Costume – Your little one will take the flag for the most Halloween candy collected in this Halloween costume for boys! 3. Magician Costume – Abracadabra! There will be lots of surprises in store for your junior magician as he uncovers all of the secret compartments and accessories that come with this adorable Halloween costume! 4. Physician Costume – He may not be a doctor in real life, but this detailed physicians Halloween costume for boys will make people look twice! 5. Astronaut Costume – There is nothing your little astronaut can’t achieve! With this fun Halloween costume, there’s also no limit to the amount of Halloween treats he’ll collect! 6. Royal Prince Costume – Celebrate your little prince with this finely tailored Halloween costume that’s made for a king! 7. Elite Pirate Costume – Argh, matey! There will be no walking the plank in this detailed pirate costume! 8. 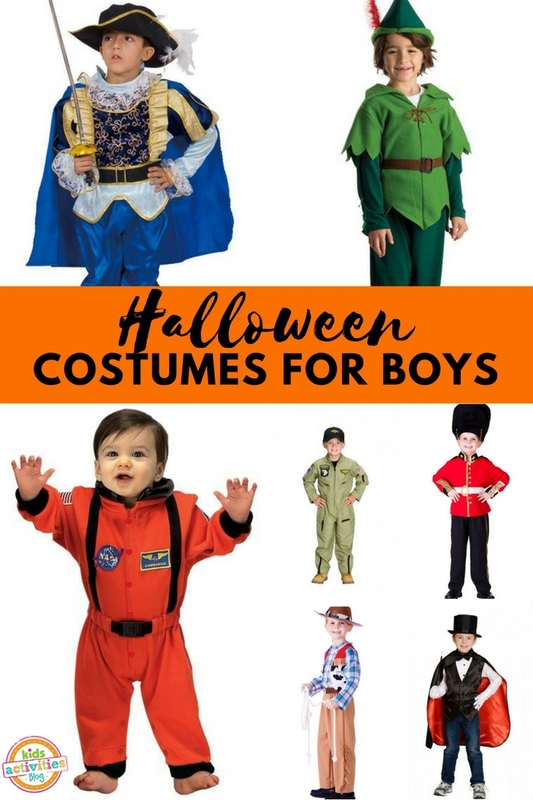 Colonial Aristocrat Costume – There’s no mistaking a young gentleman when you see him and this finely made Halloween costume for boys shouts aristocracy! 9. Peter Pan Costume – Trick or treat Neverland-style with this beautifully designed Peter Pan costume! 10. Cowboy Costume – The Wild West will never be the same once this Halloween costume for boys hits the streets! 11. Indian Warrior Costume – Let your little one embrace his inner warrior with a costume that showcases his Native American heritage! 12. Deluxe Knight Costume – In this finely detailed Halloween costume, King Arthur would be proud to call this little knight a friend! 13. Navy Admiral Costume – Join the Navy with this patriotic Navy Admiral costume! 14. Deluxe Royal Guard Costume – The Royal Guard has never looked so fine! This Deluxe costume has plenty of detail to impress! 15. Blue Noble Knight Costume – Become a Musketeer this Halloween with the help of this detailed outfit!